The ringing of bells, or "change ringing", evolved in England in the early part of the 17th century. Since those early times, there have been some improvements made to the materials used in the belfry and new bell installations are usually hung in steel frames rather than the traditional timber. However, if a bell ringer from those early days were to return now he would have no difficulty handling the bells today. The way we make them ring, and the words and phrases we use in the tower, are much the same as they were then. Tradition is a very important part of bell ringing and ringers are careful to preserve all that has been handed down over the years. At St. Mary's, Holme-next-the-Sea there is a ring of five bells. The heaviest bell, the Tenor, weighs 7¾ cwt (394 kg) and the lightest, the Treble, weighs 2 cwt (102 kg). The Treble is also our oldest bell having been cast by Eddy Tooke in 1677. For a number of years the bells had been chimed by swinging them to and fro using the attached ropes. Although the bells did 'ring', it was very difficult to control the order in which they sounded. 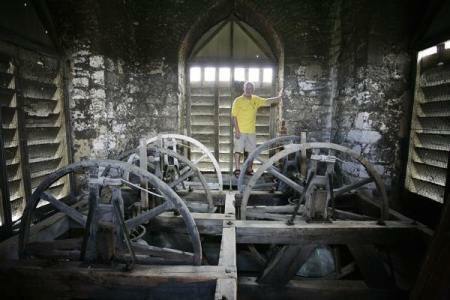 In August, 2002 a band of local villagers investigated the possibility of restoring the bells to full working order with a view to ringing them full circle - the way that they were designed to be rung. At that time we knew nothing about bell ringing, but we soon started to learn! After seeking the advice of a few experts we worked on the bells and soon had them ready to be rung in the traditional manner. At this stage we hit a snag. We had no idea what the traditional manner actually involved! With the help of other towers, especially those at Great Bircham and Dersingham, ten of us started to learn how to handle the ropes - and the bells attached to the end of the ropes. A few months later, and slightly nervously, five of us rang in rounds (that's the five bells in order from the lightest to the heaviest) for the first time. Soon we were ringing before Sunday services and that was particularly satisfying being the reason the tower was originally built and the bells cast and hung in the belfry. During the last four years the number of ringers at Holme-Next-The-Sea has dwindled but in August, 2005 we were fortunate that two from Heacham joined us followed by another Heacham ringer mid-2008, bringing our numbers up to five at the time of writing. We still manage to ring for most services and for all of those events when ringing has been requested. The bells have joyfully announced weddings, rung solemnly and half-muffled for funerals and have rung to mark special occasions including H.M. The Queen's 80th birthday, the 200th Anniversary of Admiral Lord Nelson's Victory at Trafalgar and the 60th Anniversary of the end of World War Two. Bell ringing is fun and a very sociable hobby. It is being part of a team and learning something new. Most importantly, it is providing a service to the church. Once the basics have been mastered many ringers are quite content to ring the more simple change patterns for services. However, there is much to aim for and a ringer can choose to learn named patterns of changes called 'methods'. Wonderful titles such as "Plain Bob Minimus", "Reverse Canterbury Pleasure Place Doubles", "Grandsire Triples" and "Stedman Cinques" are given to methods where the bells ring in a different order at each pull of the rope. 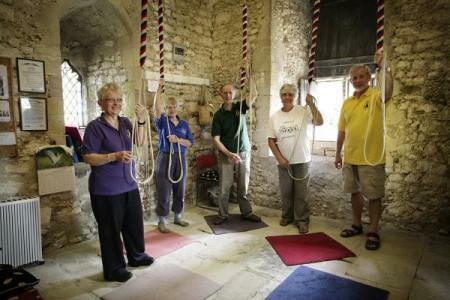 If you are between 10 and 80 years of age and reasonably fit then you could probably learn to ring church bells and join the other 40,000 or so ringers worldwide who enjoy "The Exercise". They are young and old, men and women, short and tall, girls and boys, non-musical and musical, church-goers and non-churchgoers. There are more than 5,000 church towers with bells suitable for change ringing and a ringer is always made welcome at any of them. Many towers also have a set of hand bells and, whilst these can be used to ring similar changes to those rung on the church bells, the ringers can also ring well known tunes. Unfortunately, we have no hand bells at St. Mary's, and, as always, funds are low. If anyone knows of a set of hand bells just sitting around in a cupboard, attic or cellar and doing nothing we would be very pleased to have them refurbished and give them a loving home! 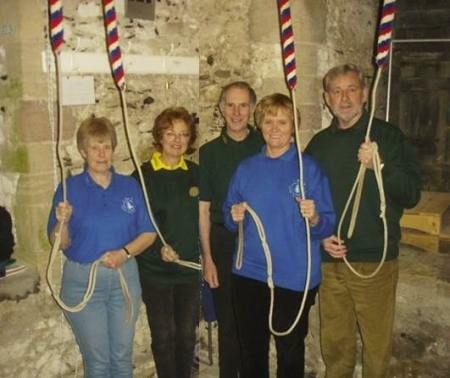 Do come along and see for yourself the bell ringers in action. If you have ringing experience come and join our band. If you have never rung a church bell now is a good time to start! Please contact me and I will be happy to chat about learning to ring or arrange a visit to the tower at St. Mary's, Holme-next-the-Sea. or check out our web site at St. Mary's, Holme-next-the-Sea Society of Bell Ringers.